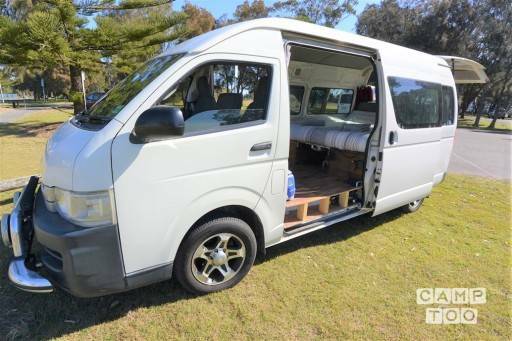 I have personally custom made this van setup over the past 3 months, It has just had a full service and I tested it on a road trip to the north of Queensland. Such a dream to drive, great Air Conditioning and handling, great fuel economy and loads of space. Escape the city lights and head to the bush or coast for that much needed relaxation time. I just took it up to Far North Queensland for a 2 month holiday and it was just awesome! Unlimted KM's and available anytime. All the camping necessities included to have you living the simplistic no stress lifestyle. Includes King Size Bed, All Bedding and Pillows. Water Tank, Powered Fridge, Slide out rear table, Gas Cooker, Pots, Pans, Cutlery, Plates, 2 Camping Chairs, Power Invertor to run electronic devices, Latest GPS with Australia Wide Map all as pictured. You can pick up the camper in Surry Hills at Nathan's place.